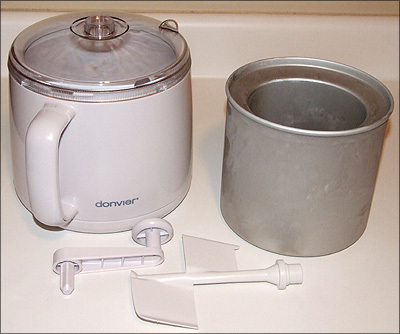 The ice cream maker is a Donvier (made in Canada), and has a metal cylinder you freeze in the freezer (no rock salt required) and has a manual handle to churn the ice cream, which is very satisfying, and easy to do while watching tv or reading food blogs. Since we’ve acquired this magical piece of kitchen equipment, we’ve been doing a lot of experimentation, and I’m finally getting around to posting about it – sorry it took so long – ice cream coma! We’ve learned that we definitely prefer the ice cream that’s made with the cooked custard-like base with eggs, as opposed to the non-egg recipe that’s also not cooked. The custard-base ice cream turns out SO smooth and creamy, and while the non-cooked, non-egg one is also very good, it’s a little more ‘ice crystally’ and not as smooth and creamy – your mileage may vary. The first cooked ice cream that we made was based on a basic ice cream recipe we found on the internet and adjusted to our own taste – see below. For this batch, though, we went overboard, and instead of JUST adding cocoa, we also added 3 ounces of finely chopped dark chocolate, which melted into the custard base before it cooled. 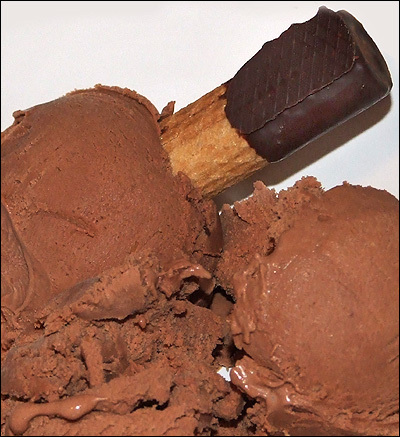 The ice cream was ALMOST (I said ALMOST), if there is such a thing, TOO chocolatey, but was magnificent and decadent! Needless to say, it didn’t last very long. Stay tuned for more ice cream experimentation results, including frozen yogurt, and what to do with leftover fudge (wild guess?). Basic recipe is for vanilla, with chocolate additions added optionally. Combine sugar, milk, and salt (and 1/3 cup cocoa if making chocolate) in a saucepan over low to medium heat, stirring constantly. Bring to a simmer. Remove from the heat. (To make extra decadent chocolate, you can add 2 ounces of chopped semisweet chocolate chips at this point – stir until melted.) Pour into a bowl and refrigerate for about two hours until completely cold, stirring occasionally. After it is completely cooled, stir in the 2 cups heavy cream and the vanilla until nicely blended. Then pour into your ice cream maker and freeze according to directions.